I'm presuming the storm bolters aren't finished? While the model overall looks great, the storm bolters kind of look unfinished. Casey's Law wrote: Lovely TDA, H! I think they'll look awesome with the details finished. Thanks Casey. I hope so. 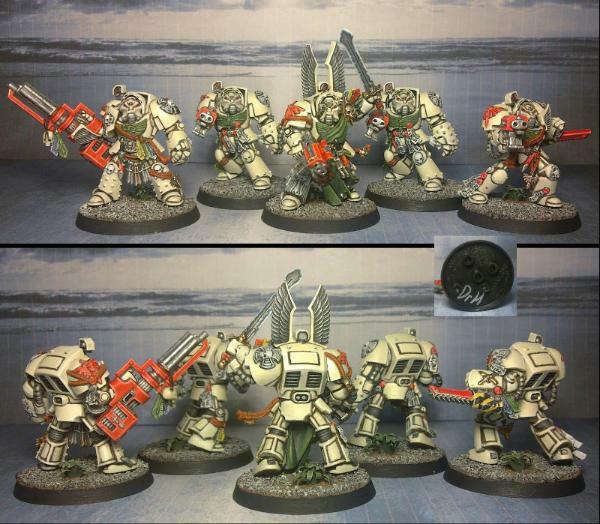 blood lance wrote: I'm presuming the storm bolters aren't finished? While the model overall looks great, the storm bolters kind of look unfinished. Indeed, the weapons haven't been started yet. They will look more finished eventually. Its a lovely smooth armor you have going on. Will see what you do with the rest. Thanks Comrade. The armour is smoother now. Also, the greens and greys are done. The metals and the reds are basecoated. Also, as it's actually relevant to this blog (even though I've been posting them in my other blog ), here's a preview of what will become boxes that I will be selling once they are cast up and ready to go. 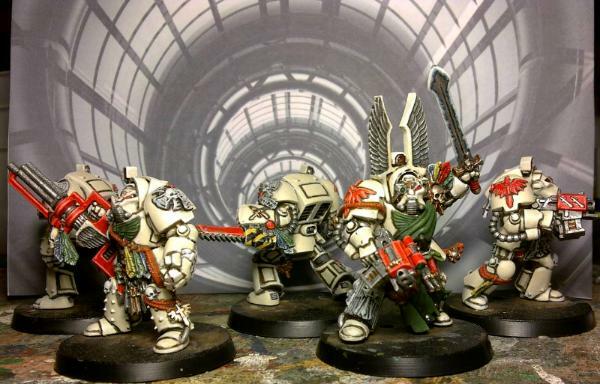 Great looking terminators. Box lids... or 1 side of a 6 sided object. Nice. Those are the sides of the boxes, you'll get two of each of the two sides you see here for each box and then two tops / bottoms (these are at the planning stage as they need to fit the sides once built). It'll make sense when I'm nearer completion. I going to go out and say, you are charging too steep in my opinion. 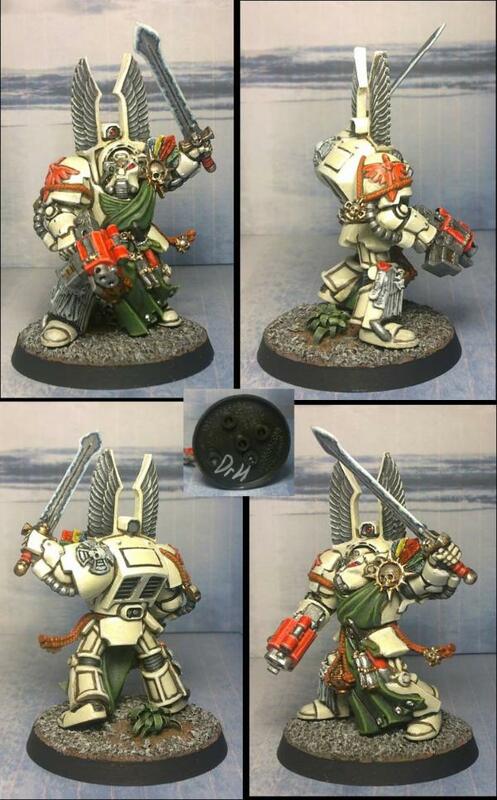 Character models professionally painted typically go for 20-30% more then their value(for a quick sale). That particular model's value is not justifying that cost. If it sells good job! But don't be sad if it doesn't. Yeah I know what you mean Comrade. Thanks for the numbers I'll pass it on to my friend. It'll go when we find the right price and then we'll know for the future. The terminators are very nearly finished. Just the bases and any minor touch-ups (that may become apparent and yes I've done the tip of the power sword already ) are all that is left to do. I'm thinking of giving them a small sprue plant each on their bases, would that be nice? I'm not sure everyone will like the power effect on the sword, but I've tried to do it in the same "high contrast" look as the armour. Any issues that you can see, let me know while I can still fix it. The cloaks and the green need some highlighting. I did wonder if I had been bold enough with the highlighting on the green... obviously not. Thanks, I'll sort that out. Well after much deliberation and far too long, I'm calling the Terminators done. I could spend many more hours touching up the tiniest bits, but it's just not worth the extra time. 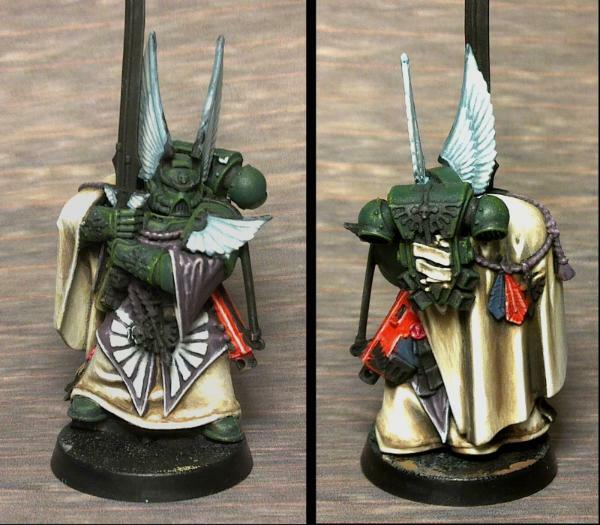 So, may I present the Dark Angels Deathwing Terminator Squad Barachiel. Notice that this is an opportunity to acquire some of my sprue work in the shape of some hand-crafted plants on each of their bases. I'll post up the ebay link once it's up. Well, since technicaly you're doing commisions now, I reserve the right to be very critical of the tiniest errors. Look closely at the crossed sword emblem on the chainfist armed Terminator. You seem to have some paint bleed onto the fist ermer. Other than that, solid job. Just don't charge an arm and a leg, 0k? Well, since technicaly you're doing commisions now, I reserve the right to be very critical of the tiniest errors. I expect nothing less as I am highly critical of all my work. Look closely at the crossed sword emblem on the chainfist armed Terminator. You seem to have some paint bleed onto the fist ermer. Other than that, solid job. You mean around the emblem? That's meant to be there, a dark outline like all the armour plates. It's a dark brown, whereas the emblem is shaded from a bronze through gold to silver so it probably does look just like bleed. The base green of the plants is actually a different green, but yes the highlights are the same green as is on the other green although the highlights on the plants do go more brown/beige than on the terminators. Just don't charge an arm and a leg, 0k? My friend sets the prices as he's more in-tune with ebay then I am, but if they don't go then the price will drop as it did for the Librarian. The ebay listing is up here. Thanks Vik. Yeah, I really wanted the red to jump out at you. There has been some interest in them already, but they are still currently available. The Librarian sold a few days ago, so he is off helping his new master keep their books in order. Ah, I realised that the link for the original listing of the Terminators is not so useful any more. Here's the new one should you be interested. Coming soon: Boxes of all (well, some) shapes and sizes. Here's an example of what you can do with them. There are two flavours of not so cubic box in the pipeline, so you may get your wish. how tall would that two flavoured boxes then be? For comparison, the one shown here is 26x25x22mm (l, w, h). The large plain box (ideal for an ark) is 22x22x35mm. The large box with cross beams is 24x25x35mm. and I have a small box which is 18x19x23mm. These are rough measurements from the original carvings and may change a little (+ or - 1mm) by the time I make the final casts. I have many plans for more boxes (as well as other objects) in the future, but you have to start somewhere. 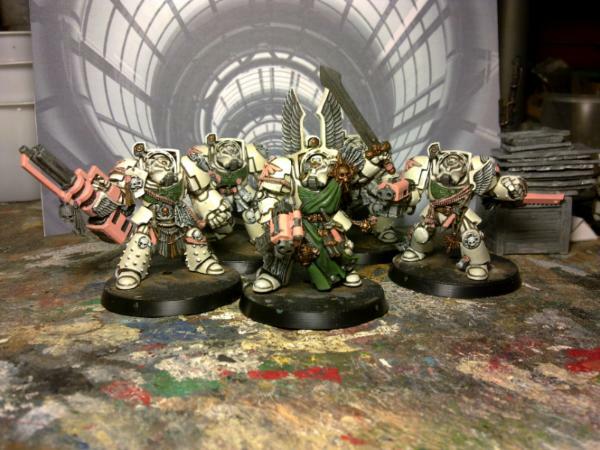 Been a little quiet on the commission front for a little while as I have been finishing some models for my own army. 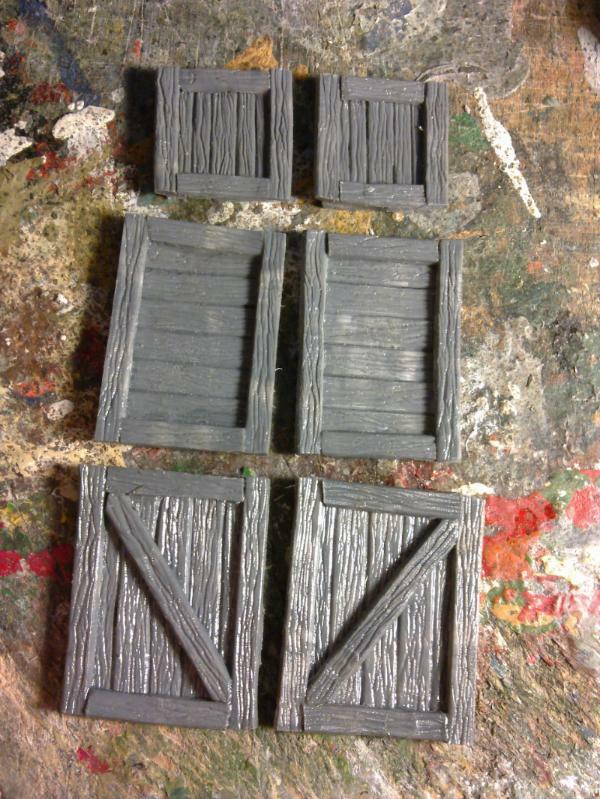 I have also been working on the boxes and toilets and should be attempting the casting of them soon. 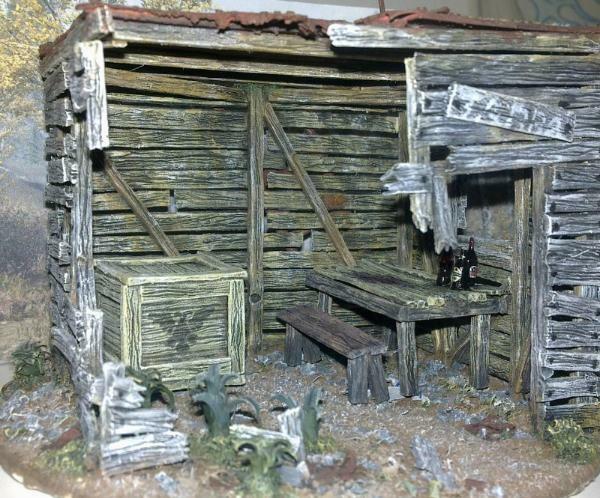 I asked in my other blog about what people wanted me to make (hence the boxes and toilets) but if anyone here has an idea of something they would like to see (and potentially buy) let me know. Not all necessarily made as separate entities (possible base decorations) and if something can be made from different materials (wood or metal...), it will be. I've only done the green and bone so far, long way to go yet. He is such a PITA to paint. 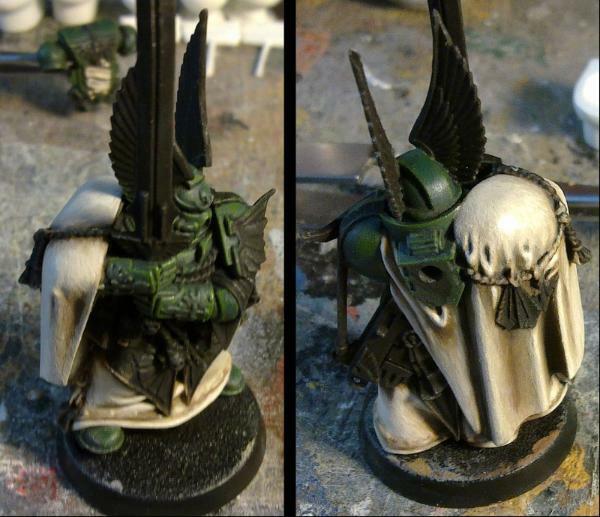 I've had mine for almost a year, and I've finished; the second highlight on the cloak. I have done more on him, namely purples, reds and whites. I may show some more before I move on to the metals. So I said I would update before I started the metals, so here is the Chapter Master as he is so far. I'm about to start on the various metals and then I'll move on to the odds and ends, like the strap for his combi-plasma. There are bits that need touching up, so he won't look as rough when he's finished. 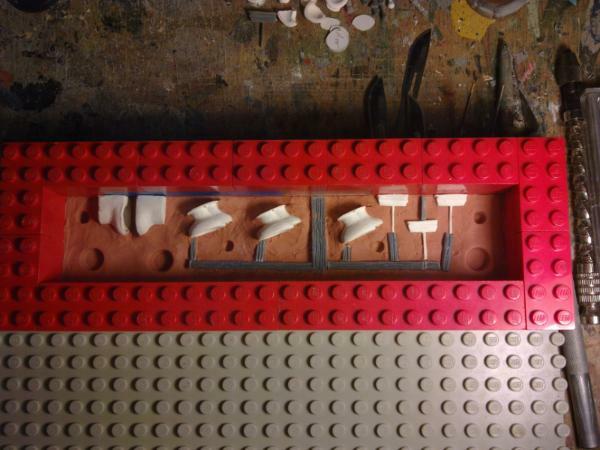 For those of you not following my other blog, the moulds are coming along and I will soon be casting not only the toilets, but the boxes as well. Keep you eyes peeled for that (but don't hold your breath... ).